Making Disciples of Jesus Christ by equipping them for the work of the ministry. First Friday of every month. Meet in a members home for a special activity, refreshments, and fellowship. Crossroads' Children Ministry is dedicated to walking with children as a role model as they grow up. The children's ministry teaches children throughout their years in elementary school until they are old enough to enter the Student Ministry. The children's ministry teaches the importance of living as a child in Christ. The children are learning the basic principles of Christianity. We invite you to join us and allow us to guide your children in a walk with God. Crossroads Student Ministry consists of our students from middle school to high school. The student ministry is going through multiple college level doctrinal studies to learn more about what it means to be a Christian and many other things the Bible has to tell us. Packed with games, events, outreach, and ministry, the students learn to be a servant to God, while also getting the opportunity to serve in the community. At Crossroads Baptist Church, we take serious the command of our Lord in Acts 1:8 "You shall be a witness to Me in Jerusalem, and in all Judea and Samaria, and to the ends of the earth." It is our firm conviction our Lord intends for us to spread the Gospel of Christ starting in our local communities, then branching out to our state, nation, and world with the good news that Jesus saves. 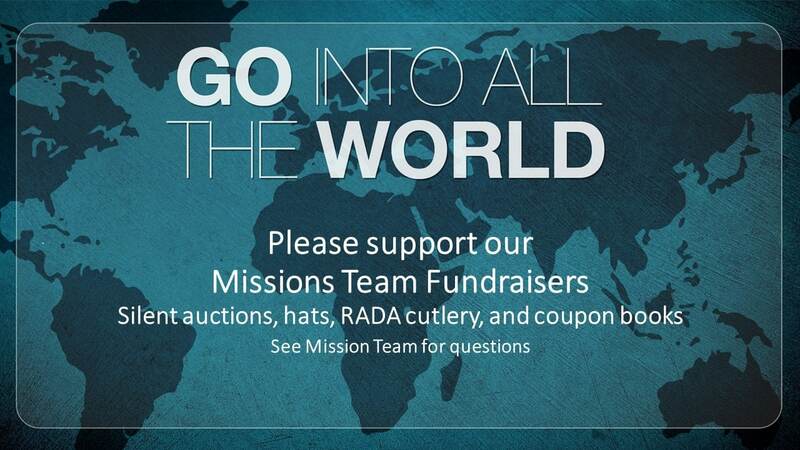 The purpose of the Missions Team is to create and promote opportunities that enable our church family to reach the world with this life changing Gospel. Members who would like to serve on are expected to make an annual commitment .